Alabama Foreclosure: What Is A Loan Modification? A loan modification is simply where you and the mortgage company agree to make a change, or modify, the loan. This is often used to prevent a foreclosure and can also be part of the three requirements to settle a case after a foreclosure. 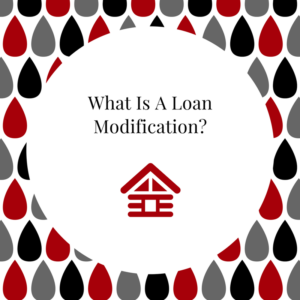 A loan modification is a specific type of loss mitigation. Loss mitigation is a broad term that simply means ways to prevent the loss of your home through foreclosure. Certainly the most common form of loss mitigation is a “loan modification” so let’s look closely at what this can do for you. There are several ways a mortgage loan can be modified. Your monthly payment can be reduced temporarily or permanently. How does a loan modification avoid a foreclosure? A foreclosure is when you are late — at least 120 days late. But if your loan is “modified”, then you will not be considered late. (As long as you pay the new modified loan). So if you are not late, then there is no foreclosure. Loan modifications can be great but there are a few things to consider in any loan modification . . . .
What are the credit reporting implications? What explains the reduction in monthly payments? Is there a large “balloon” type payment at the end of the loan? Bottom line is you need to read the whole agreement to make sure you understand exactly what is happening. Be aware of mortgage companies that change their minds about what they do with your account. For example, they promise to modify your mortgage loan, but change their mind and foreclose on you. Or it decides that it should have never agreed to the loan modification so it will hold you in default for not making the “right” payments. These are dirty tricks by the mortgage companies that will lead to a wrongful foreclosure unless you take action. Discover everything involved in the loan modification. Then take action to protect yourself and your family. One way to begin is by learning the stages of foreclosure in Alabama so you can see how a loan modification can help you avoid a foreclosure. We also recommend going to www.ForeclosureDVD.com where you can get (for free) a comprehensive training course on how to avoid a foreclosure. We discuss many things in the course including loss mitigation and loan modifications. If you live in Alabama and want to discuss this with us, give us a call at 1-205-879-2447. You can also get in touch with us by filling out a contact form and we will get in touch with you as soon as possible. We’ll be glad to answer any of your questions.